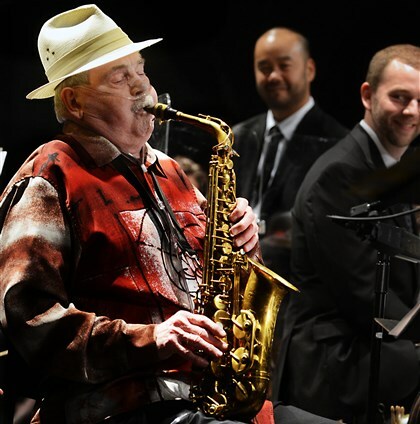 It was announced recently at the Manchester Craftsmen’s Guild in Pittsburg,Pennsylvania that alto saxophonist and NEA Jazz Master Phil Woods is retiring from performing because of challenging health issues. Woods was on hand to lead a local trio and the Pittsburg Symphony Orchestra in a swinging reprisal of the Charlie Parker With Strings album. Well, it was a historic concert but, before his last number, Mr. Woods, best known to Jazz aficionados as, one of the last surviving Charlie Parker disciples. announcing the present concert would be his last..Ever! Phil Woods, a top shelf performer, had a stellar backing unit with him from the Pittsburg area, bassist, Paul Thompson, pianist Alton Merrell, and drummer Tom Wendt. Next Post HAPPY 85 TO JAZZ LEGENDARY SAXOPHONIST SONNY ROLLINS ! yet & still This Saxophone player pled 2 his last breath…sleep on my prince.